"The first was a trip to Paris. A tip from a travel guide sent us to Puzzle Michèle Wilson, a small shop specializing in traditional wooden jigsaw puzzles. As you enter, an artisan sits to your left cutting a tidy stack of plywood sheets with a scroll saw. She isn't following a prescribed pattern and hence each time she cuts, she creates a different puzzle. The results are dissimiliar from the gridded bits of cardboard we knew in childhood. The pieces were all unique shapes, incorporating funny curves, spirals and even surprise pieces shaped like recognizable figures. Freed from the constraints of mass production, puzzles were suddenly more exciting and creative." 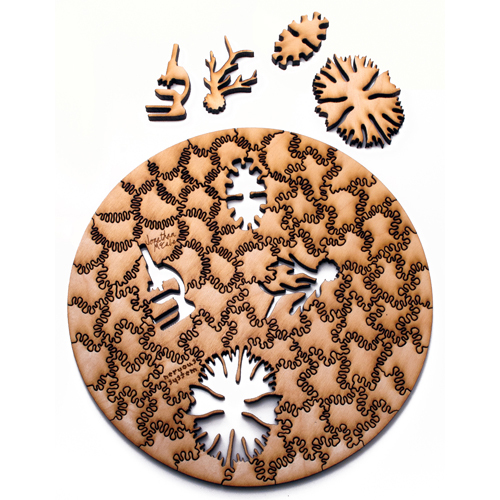 Read more about these Generative jigsaw puzzles by clicking here. We also have traditional wooden jigsaw puzzles for sale with all sorts of different types of imagery. Fine art, animals, landscapes and more great beautiful works of art on this type of puzzle.